Track Every Coin’s Dashboard provides you a high level understanding of your finances. In this article we will show you how you can analyze your expenses under transactions. 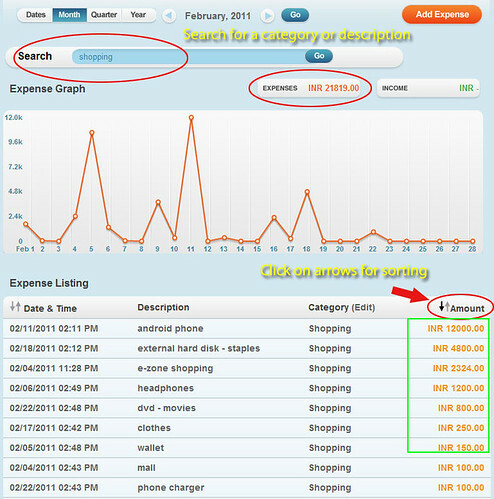 Overall view of your expenses are seen as follows in your transaction tab. Of course your transaction graph is the largest data point. Another most important graph is your thermometer graph on top of the screen. Notice your net income, expense, savings and budget displayed. It shows how you can set a budget and see your expenses against it. Shorter the expense thermometer, larger will be your savings! Next important graph will be the pie-chart. Notice how it is sorted in descending order, thereby giving you the top categories you have spent in. Once you know this, it s easy to analyze your expenses further. Under search, you can search for your top expense categories. Eg: Shopping. When you search for a category, notice below that the search total is displayed instantaneously. In the below case we can see the total for shopping for the current month. 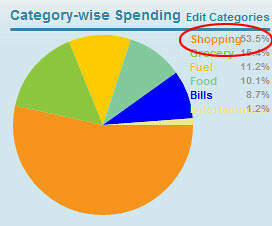 To understand where and how did you spend, just click on the arrow next to “Amount”. This will sort all your “Shopping” expenses in descending order. 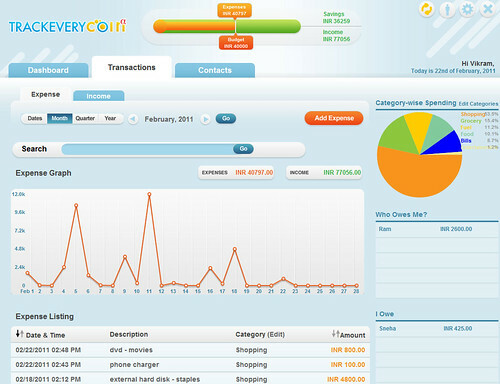 Now view your top highest expenses under shopping. Similarly you can search for any category / description over different date range (Month, Quarter, Year) and sort your grid. Log on to your account and try this out! I installed trackeverycoin in my office desktop and it works fine. I installed it later in my home desktop, and when I try to login it says “User already exists” and doesn’t let me sign in. So can’t I have multiple installations on different machine for the same account. You can have multiple installations. From a different machine, enter a different Nickname” The email ID and Password remains the same.